Interprofessional education and collaborative practice have borrowed heavily and widely from various academies of thought, including sociology, psychology, education, anthropology, economics, political science, organizational theory…... and so on. The aim of this section is to present a synopsis of the relevant theories espoused in relation to interprofessional education and bring together a wide array of resources for those who wish to dive a little deeper. Clark PG. What would a theory of interprofessional education look like? Some suggestions for developing a theoretical framework for teamwork training 1. J Interprof Care. 2006 Dec;20(6):577-89. PubMed PMID: 17095437. The focus of the January 2013 edition of the Journal of Interprofessional Care (Volume 27), was theory use in interprofessional education and collaboration. You may wish to consider the following theories. This list is not exhaustive. 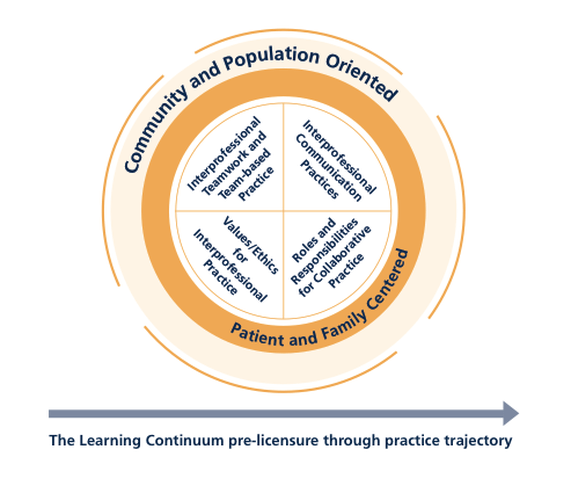 The CIHC Evaluation Framework originated from the interprofessional education for collaborative, patient-centred practice projects (IECPCP), funded by Health Canada. The initial intent was to catalog the instruments and outcomes of the funded projects. Further development by D’Amour and Oandasan (2004) has led to the provision of this very useful resource that can assist with the selection of assessment tools for interprofessional activities, including assessment of the educational system, health professional learner outcomes, the professional system, government policy, and patient / provider outcomes. The following articles contain reviews and guidelines on how to apply best practice to the evaluation of interprofessional educational activities. Freeth, D., Reeves, S., Koppel, I., Hammick, M., Barr, H. (2005) Evaluating Interprofessional Education: A Self-Help Guide. Higher Education Academy. This article by Freeth et al (2005) provides a guide for both novice and experienced evaluators to assessing interprofessional activities. It includes the 3P model adapted from Freeth & Reeves (2004), the 3P’s representing presage, process and product. Presage relates to the constraints and influences on the design and delivery of IPE activities, process to the delivery, including approaches to teaching and learning, and product is concerned with the outcomes of IPE activities. This article catalogs the evaluation frameworks and tools used in 20 Canadian interprofessianal education and collaborative patient-centered practice (IECPCP) learning projects. Thistlethwaite J, Moran M; World Health Organization Study Group on Interprofessional Education and Collaborative Practice. Learning Outcomes for Interprofessional Education : Literature Review and Synthesis. J Interprof Care. 2010 Sep;24(5):503-13. Review. PubMed PMID: 20718596. Gillan C, Lovrics E, Halpern E, Wiljer D, Harnett N. The evaluation of learner outcomes in interprofessional continuing education: a literature review and an analysis of survey instruments. Med Teach. 2011;33(9):e461-70. Review. PubMed PMID: 21854139. Heinemann, G.D., Schmitt, M.H., Farrell, M.P., & Brallier, S.A. (1999). Development of an Attitudes Toward Health Care Teams Scale. Evaluation & the Health Professions, 22, 123-142. Hyer, K., Fairchild, S., Abraham, I., Mezey, M., Fulmer, T. (2000). Measuring attitudes related to interdisciplinary training: revisiting the Heinemann, Schmitt and Farrell ‘attitudes toward health care teams’ scale Journal of Interprofessional Care 14(3): 249-258. Parsell G, Bligh J. The development of a questionnaire to assess the readiness of health care students for interprofessional learning (RIPLS). Med Educ. 1999 Feb;33(2):95-100. PubMed PMID: 10211258. McFadyen, A.K., Webster V., Strachan K., Figgins E., Brown H., Mckechnie J. (2005). The Readiness for interprofessional learning scale: A possible more stable sub-scale model for the original version of RIPLS. Journal of Interprofessional Care 19(6): 595 – 603. Lê Q, Spencer J, Whelan J. Development of a tool to evaluate health science students’ experiences of an interprofessional education (IPE) programme. Ann Acad Med Singapore. 2008 Dec;37(12):1027-33. PubMed PMID: 19159037. Hammick M., Freeth D., Koppel I., Reeves S., and Barr H., A Best Evidence Systematic Review of Interprofessional Education: BEME Guide no. 9, Medical Teacher, 2007, 29(8): 735-751. Reeves S, Zwarenstein M, Goldman J, Barr H, Freeth D, Koppel I, Hammick M. The effectiveness of interprofessional education: key findings from a new systematic review. J Interprof Care. 2010 May;24(3):230-41. Review. PubMed PMID: 20178425. Reeves S, Zwarenstein M, Goldman J, Barr H, Freeth D, Hammick M, Koppel I., Interprofessional education: effects on professional practice and health care outcomes. Cochrane Database Syst Rev. 2008 Jan 23;(1):CD002213. Review. PubMed PMID: 18254002. Thistlethwaite J. Interprofessional education: a review of context, learning and the research agenda. Med Educ. 2012 Jan;46(1):58-70. doi:10.1111/j.1365-2923.2011.04143.x. PubMed PMID: 22150197. Oandasan I. and Reeves S., Key Elements of Interprofessional Education. Part 1: The Learner, the Educator, and the Learning Context, Journal of Interprofessional Care, May 2005, 1 (suppl): 21-38. Oandasan I. and Reeves S., Key Elements of Interprofessional Education. Part 2: Factors, Processes and Outcomes, Journal of Interprofessional Care, May 2005, 1 (suppl): 39-48. Reeves S, Goldman J, Oandasan I. Key factors in planning and implementing interprofessional education in health care settings. J Allied Health. 2007 Winter;36(4):231-5. PubMed PMID: 18293805. Thistlethwaite J, Moran M; World Health Organization Study Group on Interprofessional Education and Collaborative Practice. Learning outcomes for interprofessional education (IPE): Literature review and synthesis. J Interprof Care. 2010 Sep;24(5):503-13. Review. PubMed PMID: 20718596. Kendall H., et al., Making Interprofessional Education Work: The Strategic Roles of the Academy, Academic Medicine, October 2008, 83(10): 934-940. Bridges DR, Davidson RA, Odegard PS, Maki IV, Tomkowiak J. Interprofessional collaboration: three best practice models of interprofessional education. Med Educ Online. 2011 Apr 8;16. doi: 10.3402/meo.v16i0.6035. PubMed PMID: 21519399; PubMed Central PMCID: PMC3081249. Hoffman SJ, Harnish D. The merit of mandatory interprofessional education for pre-health professional students. Med Teach. 2007 Oct;29(8):e235-42. PubMed PMID: 18236267. Buring SM, Bhushan A, Broeseker A, Conway S, Duncan-Hewitt W, Hansen L, Westberg S. Interprofessional education: definitions, student competencies, and guidelines for implementation. Am J Pharm Educ. 2009 Jul 10;73(4):59. PubMed. PMID: 19657492; PubMed Central PMCID: PMC2720355. Curran VR, Deacon DR, Fleet L. Academic administrators’ attitudes towards interprofessional education in Canadian schools of health professional education. J Interprof Care. 2005 May;19 Suppl 1:76-86. PubMed PMID: 16096147. Curran V.R., Sharpe D., and Forristall J., Attitudes of Health Sciences Faculty Members Towards Interprofessional Education, Medical Education, 2007, 41: 892-896. Alberto J., Herth K., Interprofessional Collaboration within Faculty Roles: Teaching, Service and Research. Online Journal of Issues in Nursing, 2009, May:14 (2). Silver I.L. and Leslie K., Faculty Development for Continuing Interprofessional Education and Collaborative Practice, Journal of Continuing Education in the Health Professions, 2009, 29(3): 172-177. PubMed PMID: 19728382. Egan-Lee E, Baker L, Tobin S, Hollenberg E, Dematteo D, Reeves S. Neophyte facilitator experiences of interprofessional education: implications for faculty development. J Interprof Care. 2011 Sep;25(5):333-8. PubMed PMID: 21823882. Johnson AW, Potthoff SJ, Carranza L, Swenson HM, Platt CR, Rathbun JR. CLARION: a novel interprofessional approach to health care education. Acad Med. 2006 Mar;81(3):252-6. PubMed PMID: 16501268. Curran V.R., Sharpe D., Flynn K., and Button P., A Longitudinal Study of the Effect of an Interprofessional Education Curriculum on Student Satisfaction and Attitudes Towards Interprofessional Teamwork and Education, Journal of Interprofessional Care, January 2010, 24(1): 41-52. Hawk C., Buckwalter K., Byrd L., Cigelman S., Dorfman L., and Ferguson K., Health Professions Students’ Perceptions of Interprofessional Relationships, Academic Medicine, April 2002, 77(4): 354-357. Reeves S. and Pryce A., Emerging themes: an exploratory research project of an interprofessional education module for medical, dental and nursing students, Nurse Education Today, October 1998, 18(7): 534-541. Solomon P., Baptiste S., Hall P., Luke R., Orchard C., Rukholm E., Carter L., King S., and Damiani-Taraba G., Students’ Perceptions of Interprofessional Learning Through Facilitated Online Learning Modules, Medical Teacher, 2010, 32: e391-e398. Coster S, Norman I, Murrells T, Kitchen S, Meerabeau E, Sooboodoo E, d’Avray L., Interprofessional attitudes amongst undergraduate students in the health professions: a longitudinal questionnaire survey. Int J Nurs Stud. 2008 Nov;45(11):1667-81. Epub 2008 Apr 18. PubMed PMID: 18423644.
Cooper H, Spencer-Dawe E, McLean E. Beginning the process of teamwork: design, implementation and evaluation of an inter-professional education intervention for first year undergraduate students. J Interprof Care. 2005 Oct;19(5):492-508. PubMed PMID: 16308172. Pollard KC, Miers ME. From students to professionals: results of a longitudinal study of attitudes to pre-qualifying collaborative learning and working in health and social care in the United Kingdom. J Interprof Care. 2008 Aug;22(4):399-416. PubMed PMID: 18800281. Pollard KC, Miers ME, Gilchrist M, Sayers A. A comparison of interprofessional perceptions and working relationships among health and social care students: the results of a 3-year intervention. Health Soc Care Community. 2006 Nov;14(6):541-52. PubMed PMID: 17059496. Zwarenstein M., Goldman J., and Reeves S., Interprofessional Collaboration: Effects of Practice-Based Interventions on Professional Practice and Healthcare Outcomes (Review), Cochrane Database of Systematic Reviews 2009, Issue 3. Art No: CD000072 DOI: 10.1002/14651858.CD000072pub2. Steven A, Dickinson C, Pearson P. Practice-based interprofessional education: looking into the black box. J Interprof Care. 2007 Jun;21(3):251-64. PubMed PMID: 17487704. Robson M, Kitchen SS. Exploring physiotherapy students’ experiences of interprofessional collaboration in the clinical setting: a critical incident study. J Interprof Care. 2007 Feb;21(1):95-109. PubMed PMID:17365377. Copley JA, Allison HD, Hill AE, Moran MC, Tait JA, Day T. Making interprofessional education real: a university clinic model. Aust Health Rev. 2007 Aug;31(3):351-7. PubMed PMID: 17669056. Liedtka JM, Whitten E. Enhancing care delivery through cross disciplinary collaboration: a case study. J Healthc Manag. 1998 Mar-Apr;43(2):185-203; discussion 203-5. PubMed PMID: 10179019. Phelan AM, Barlow CA, Iversen S. Occasioning learning in the workplace: the case of interprofessional peer collaboration. J Interprof Care. 2006 Aug;20(4):415-24. PubMed PMID: 16905489. Kinnair DJ, Anderson ES, Thorpe LN. Development of interprofessional education in mental health practice: Adapting the Leicester Model. J Interprof Care. 2012 May;26(3):189-97. Epub 2012 Jan 17. PubMed PMID: 22250705. Priest HM, Roberts P, Dent H, Blincoe C, Lawton D, Armstrong C. Interprofessional education and working in mental health: in search of the evidence base. J Nurs Manag. 2008 May;16(4):474-85. PubMed PMID: 18405264. Craven MA, Bland R. Better practices in collaborative mental health care: an analysis of the evidence base. Can J Psychiatry. 2006 May;51(6 Suppl 1):7S-72S. Review. PubMed PMID: 16786824. Coleman MT, Roberts K, Wulff D, van Zyl R, Newton K. Interprofessionalambulatory primary care practice-based educational program. J Interprof Care. 2008 Jan;22(1):69-84. PubMed PMID: 18202987. Bradley P, Cooper S, Duncan F. A mixed-methods study of interprofessional learning of resuscitation skills. Med Educ. 2009 Sep;43(9):912-22. PubMed PMID: 19709016. McNair R, Brown R, Stone N, Sims J. Rural interprofessional education: promoting teamwork in primary health care education and practice. Aust J Rural Health. 2001 Dec;9 Suppl 1:S19-26. PubMed PMID: 11998271. Rodgers, et al (2010), on behalf of the World Health Organization Study Group on Interprofessional Education and Collaborative Practice, conducted a global environmental scan of interprofessional education (IPE), they found that despite the existence of clearly recognized best practice evidence, IPE initiatives tended to be voluntary, were not founded upon specific learning objectives, lacked assessment and evaluation regarding there impact, and were not provided by instructors who were trained in facilitating IPE activities. Hean et al. (2012), stress the need to anchor interprofessional initiatives in theory, and numerous systematic reviews have highlighted the need to design such initiatives based upon best practice evidence. 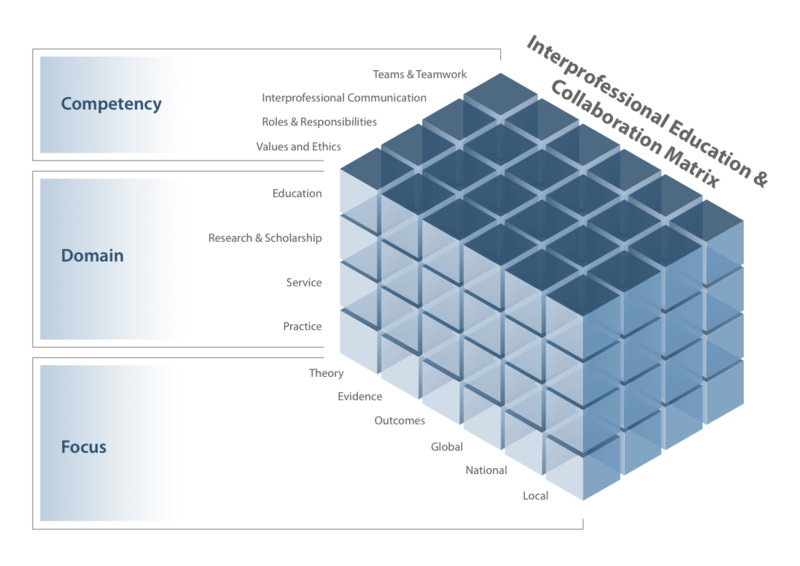 This matrix was developed to illustrate and draw attention to, the key components of interprofessional education and collaboration, and to assist in gathering and organizing, resources and evidence, for those interested in gaining an understanding of interprofessional education and collaboration. Each block of the matrix represents an intersection of a domain (e.g.education), competency (e.g. values and ethics) and focus (e.g. theory). This design of this site attempts to complete each block within the matrix, reflecting the current theoretical perspectives, available evidence, and outcome measures, it also provides information on global, national, and ATSU interprofessional initiatives. This site is intended to be a resources for those in the process of developing or refining interprofessional initiatives. Rodgers et al (2010) describe the following five evidence-based best practices, drawn from the World Health Organization’s Framework for Action on Interprofessional Education and Collaborative Practice (WHO, 2010). Interprofessional Education in Healthcare: this section will introduce students to the Interprofessional education in healthcare by exploring the concept and value of interprofessional education. Communicating Universal Language in Health Care: this section is designed to teach students universal communication skills with patients and other healthcare providers. Define and apply interprofessional education in the health care system. Apply the concept of interprofessional collaborative practice. Describe the process of team development and the role and practices of effective team. Apply a foundation of theoretical knowledge that they will be able to transfer to their telehealth clinical rotation. The ICCC on the Missouri Campus involves a collaboration with Truman State University (TSU) health professions disciplines and the ATSU IPE office in Mesa. In 2014, the KCOM Curriculum Committee approved ICCC as an elective for KCOM students and 2016 the MOSDOH Curriculum Committee approved ICCC as an elective. Also, in 2016, a sixth discipline, Social and Cultural Sciences was added to the program. The semester-long CCC course allows students to work in teams to develop leadership skills and learn about, from and with other health professions disciplines. Student teams are provided a complex web-based case that they use to develop a patient/family-centered care plan that focuses on interprofessional teamwork, patient safety, and quality of care. Course Description: Students participate in an orientation session where they are introduced to their multi-disciplinary team members and strategize how they will design their plan of care. New in 2016, two workshops were offered to students. Social work and hospice were presented by TSU professor, Rebecca Zimmer, MSW, LCSW and Carla Hustead, MSW, LCSW. The second workshop focused on presentation skills where students were given the opportunity rehearse, receive feedback and make amendments. As the culminating course activity, student teams present their plan of care using Google Slides to a panel of faculty members and community professionals. ICCC concludes with an evening of review and reflection for the students and faculty. “The interdisciplinary option (IPHC) within the House Calls program was created in 2002 in response to emerging national concerns related to improving healthcare and reducing medical errors,” said Janet Head, RN, MS, EdD, co-director, ATSU-KCOM AHEC and ATSU Aging Studies project director for the Kirksville campus. Evolving from the Interprofessional House Calls elective, our current interprofessional home visiting program is an approved elective course that offers ATSU medical and dental students the opportunity to work with Truman State University students from five health disciplines. They work in interprofessional teams with community elders. In fall of 2015, IPHP was approved as an elective for MOSDOH students. Our main elective for the spring semester, IPHP allows students the opportunity to learn about other health disciplines, work with older adults, and enhance teamwork and communication skills. ​Course Description: The course offers an orientation session that introduces key elements from the InterProfessional Education Collaborative (IPEC) core competencies, the Hartford Geriatric Interdisciplinary Team Training Curriculum (GITT), and TEAM STEPPS® a program designed to increase health care providers’ awareness of roles and responsibilities, communication skills, and ability to resolve conflict to enhance the quality of care and patient safety. Also during orientation, students become acquainted with the members of their team and are provided elder specific information. Review sessions are facilitated by faculty from ATSU and TSU. At each review session new screening tools are introduced and/or demonstrated; in addition, students report their findings and entertain questions and/or dialogue from other table team members. A newly added KCOM elective, Individual Cognitive Stimulation Therapy was added to the elective catalog December 2016 with the first cohort of students beginning January 2017. Individual CST evolved from the evidence-based group CST program developed in the United Kingdom at the University College of London. Through research, CST has been shown to improve the quality of life for those with mild to moderate dementia and at times improve cognition and language skills. Individual CST was designed for caregivers in the home as a way of engaging and interacting with the person diagnosed with dementia. ​Students are introduced to the concept and key principles of iCST through a Zoom video conference with Saint Louis University. Students are placed in teams of two. Ten home visits are required for this course and students are required to create and develop a lesson plan for each visit according to the iCST guidelines and key principles. They document each visit, and complete reflective writing assignments. Three review sessions are conducted to allow students the opportunity to discuss challenges, report on their visits, and prepare materials for upcoming sessions. Assessment tools utilized for the program are introduced and students practice using the assessment tools on community volunteers. The final review session, includes a lecture on Dementia: Diagnosis and Treatment. Student evaluations are uniformly positive, and all participants have indicated that they would recommend this program to another student. VE1. Place the interests of patients and populations at the center of interprofessional health care delivery and population health programs and policies, with the goal of promoting health and health equity across the life span. VE3. Embrace the cultural diversity and individual differences that characterize patients, populations, and the health team. VE4. Respect the unique cultures, values, roles/responsibilities, and expertise of other health professions and the impact these factors can have on health outcomes. VE5. Work in cooperation with those who receive care, those who provide care, and others who contribute to or support the delivery of prevention and health services and programs. RR1. Communicate one’s roles and responsibilities clearly to patients, families, community members, and other professionals. RR3. Engage diverse professionals who complement one’s own professional expertise, as well as associated resources, to develop strategies to meet specific health and healthcare needs of patients and populations. RR4. Explain the roles and responsibilities of other care providers and how the team works together to provide care, promote health, and prevent disease. RR5. Use the full scope of knowledge, skills, and abilities of professionals from health and other fields to provide care that is safe, timely, efficient, effective, and equitable. RR7. Forge interdependent relationships with other professions within and outside of the health system to improve care and advance learning. RR8. Engage in continuous professional and interprofessional development to enhance team performance and collaboration. RR9. Use unique and complementary abilities of all members of the team to optimize health and patient care. CC2. Communicate information with patients, families, community members, and health team members in a form that is understandable, avoiding discipline-specific terminology when possible. CC3. Express one’s knowledge and opinions to team members involved in patient care and population health improvement with confidence, clarity, and respect, working to ensure common understanding of information, treatment, care decisions, and population health programs and policies. CC7. Recognize how one’s own uniqueness, including experience level, expertise, culture, power, and hierarchy within the health team, contributes to effective communication, conflict resolution, and positive interprofessional working relationships (University of Toronto, 2008). CC8. Communicate consistently the importance of teamwork in patient- centered care and population health programs and policies. TT2. Develop consensus on the ethical principles to guide all aspects of team work. TT3. Engage health and other professionals in shared patient-centered and population focused problem-solving. TT4. Integrate the knowledge and experience of health and other professions to inform health and care decisions, while respecting patient and community values and priorities/ preferences for care. TT6. Engage self and others to constructively manage disagreements about values, roles, goals, and actions that arise among health and other professionals and with patients, families and community members. TT7. Share accountability with other professions, patients, and communities for outcomes relevant to prevention and health care. TT9. Use process improvement strategies to increase the effectiveness of interprofessional teamwork and team-based services, programs, and policies. American Interprofessional Health Collaborative (AIHC) - This organization is a great source for information on interprofessional activities within US Colleges and Universities. AIHC is aligned with the National Center for Interprofessional Practice and Education. National Academies of Practice (NAP) - Distinguished professionals advancing interprofessional healthcare by fostering collaboration and advocating policies in the best interest of individuals and communities. NAP is a collaboration between 14 professional academies. There are many excellent resources available through international organizations dedicated to promoting interprofessional education and collaboration. eLearning: Interprofessional and inter-agency collaboration (IPIAC)​ - This British site provides free e-learning resources including, audio, video and interactive technology. The aim is to help share resources that can assist in exploring the nature of interprofessional and inter-agency collaboration and in improving collaborative practice.